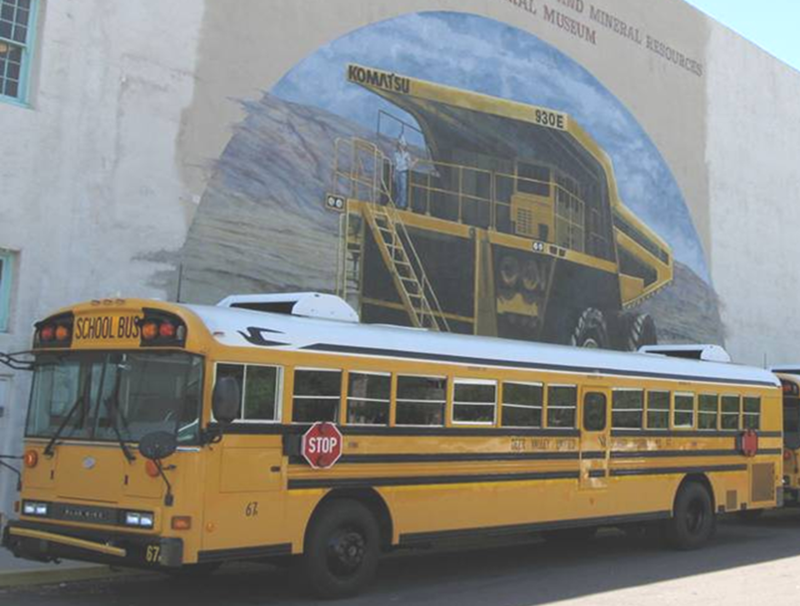 This blog is documenting the destruction of the once top rated Arizona Mining and Mineral Museum and its very popular K-12 education programs. The Arizona Historical Society gained control of the museum in 2010, and closed it in 2011. The closure was not due to funding cuts. Currently, the AHS and their lobbyists are trying to prevent reopening of the mineral museum by converting the building into some other unneeded facility, such as an event or reception center. Note: 40,000 children per year are being deprived of the unique mineral museum learning experience even though the AHS is continuing to receive the entire mineral museum budget. The following, original text was posted in 2010 when the blog began. This blog is following the destruction of the historic and top rated Arizona Mining and Mineral Museum. The legislature passed and the Governor signed Arizona House Bill 2251 which transfers the museum and facility to the Arizona Historical Society. The bill requires the historical society to convert the facility into the Arizona Centennial Museum which will feature cotton, citrus, cattle, copper, and climate. The original June 5th posting provides detail on how this bill became law. Subsequent posts address various related issues. Some are critical of the basic theme (if it is one) of the centennial museum and a few of those are sarcastic. Most address the severe impact of losing the mineral museum. The mineral museum currently serves Arizona teachers, helping them comply with State mandated K-12 earth science education standards. The mineral museum provides teacher training and class room materials. It also hosts structured field trips providing an introduction to earth sciences. School buses arrive at the museum daily, bringing over 25,000 students per year. With Arizona currently ranking absolute last in science education, ending this educational service (while spending millions more to do it) appears quite foolish. The mineral museum also maintains a world class mineral collection painstakingly acquired since before statehood. Many specimens are absolutely irreplaceable. The came form Arizona mines that no longer exist. They therefore have priceless scientific value as well as aesthetic value. This collection is now under the control of an agency that lacks the scientific credentials to properly care for it. The mineral museum also has unique and priceless mining artifacts from various historic Arizona mining districts. Tens of thousands of volunteer hours have restored some of them to operating condition, and they have both educational and historic value. The fate of these artifacts is currently unknown. In summary, millions tax dollars are being spent on a project which currently appears to have very negative consequences for science education, Arizona history, and future earth science research. Finally, a specific long term goal of this blog is to repeal the bill that inappropriately reassigned the Arizona mineral collection to the Arizona Historical Society. Postings on this blog are moderated. Bad language is not acceptable. Comments based solely on partisan politics are not acceptable either, because they would diffuse the focus of the discussion. The party affiliation of the legislatures and Governor that created this mess is irrelevant. Democrats, Republicans, and Independents should all be concerned about the adverse impact on K-12 education. The author of this blog is not registered or affiliated in any way with a political party. The purpose of the blog is to simply reveal the awful impending consequences of the mistake, and hopefully limit them.